Just got back from the Business Rules Forum in Orlando. There are lots of interesting changes going on in the market. Below is a quick summary (More to come later). I finally had a chance to meet some of the other bloggers in the BRMS BPMS BI space, like Sandy Kemsley from column 2 and Scott Sehlhorst from Tyner Blain. James Taylor has left Fair Isaac and is now blogging about Enterprise Decision Management at the Smart Enough Systems blog. Check out those blogs for their take on many of the presentations. This year BIZRULES was at the Agility Alliance booth. The alliance has grown since last year when we focused on the business rules experts group. Now our scope includes rules, process, and knowledge management. Agility Alliance members will start blogging soon over at http://agilityalliance.com/. Every year at the Forum I like to hand out what I call the BRE Family Tree. This year I didn't update it and, of course, many attendees stopped by to get the latest one. It's a good thing I did't update and print it yet, however, because it would have been obsolete by the end of the conference! What's happened is that in the last few months, key mergers and acquisitions have taken place. And vendors with new solid product offerings like Visual Rules are making waves and getting traction in the BRE market. In August, Trilogy announced their intent to acquire Gensym. As many of you know, Trilogy bought Versata last year. Trilogy's investment and committment to the BR market is impressive. The fact that Val Huber, one of the architects and founders of Versata/Vision Software is onboard and actively involved with their new direction tells me they are very committed to the BRE market. Just a few days ago, SAP announced plans to buy Yasu. That brings SAP into the BRE market. Recently, IBM acquired System Architect from Telelogic. Although not a business rule engine (BRE), SA is used on very large business rule enterprise projects as a rule/process modeling tool. How IBM plans to meld SA with their Rational sw modeling tools is still unclear, but something to keep an eye on. Haley Systems is undergoing a transformation. They were not at the conference this year, and the speculation was that they were or are about to be acquired. Nobody knows. I certainly don't, despite being a Haley services partner. Other Haley partners and customers I spoke with didn't know what was going on with Haley Systems either. Fair Isaac bought RulesPower in 2005 to acquire rights to the Rete III algorithm in order to speed up their engine. Haley's rule engine is among the fastest, if not the fastest, rule engines on the market. (I've heard this from many customers and users I talk to). So if one wanted to have a faster rule engine product, acquiring the Haley Rules engine product would be one way. ILOG's engine is right up there on speed. They're large enough to buy Haley Systems, but they really don't need more speed. As one of the top 3 vendors, they probably don't need to change anything (why change something good) just to improve performance (It's already fast) or shake up things by adding natural language to their tools. It would be a pretty unique toolset if they did add natural language to their optimization, rules, and visualization solutions. Haley is different from all the other rule engines in that it has a sophisticated natural language (i.e. English) interface that has its roots in the field of A.I. Artificial Intelligence. So if one wanted to add a true natural language front end to their rule engine, again Haley Rules would be a smart way to do that. A lot of time was spent at the conference debating the need for an upstream rule managmenet or rule modeling tool, and a downstream rule engine execution tool. 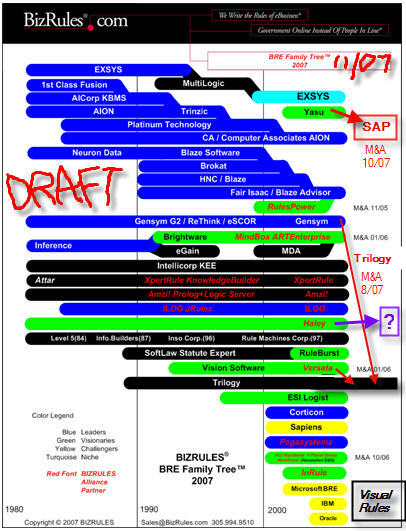 There are many proven, industrial-strength rule engine execution tools (see the BRE Family Tree), but the market for business rule management and rule modeling tools is just being born. Here's what I think: If Haley separated their natural language rule authoring tool, Haley Authority, and split that off as a separate company.... well I believe that that could actually become a great rule management front-end tool that could be enhanced to generate code for other rules engines, not just Haley Rules. Their authoring metaphor is great (English! ), and it would be a contender as a rule management tool if it was separated from the Haley Rules rule engine. Customers that already have another rule engine are not likely to buy Haley Rules just to get a copy of Haley Authority. If they separated the rule authoring tool... well I think that would really liven things up and add credibiility to the rule management space. Another potential suiter for Haley Systems is Pegasystems. Pega kind of defined or invented the BPM/BRE market, and adding natural language to BPM & BRE would also be very unique and hard to imitate. Haley Rules engine could also add a speed boost to Pega, giving them a competitive edge that would keep them going strong as one of the top 3 vendors in the space, and maybe even give them the edge they seek to surpass Fair Isaac. Trilogy is also shaking up the BRE market. With their recent acquisition of Gensym (an awesome rule engine that's among the best at "real" as opposed to "simulated" simulation...) and their prior acquisition of Versata, they have assimilated a unique set of tools that are also hard to imitate. Adding natural language to industrial-strength simulation and transaction rules would make quite a unique business rules management & automation suite. With Trilogy's or Pegasystems' financial backing behind it, customers would have few reservations to buying Haley Rules or Haley Authority. CA wasn't at the Forum, so one wonders what's going on with CA CleverPath AION Business Rule Engine. Maybe what CA needs to do is acquire Haley Rules to jump-start their product (which I still feel is one of the most powerful, truly object-oriented, industrial strength, inference engine / rule engine on the market. Aion + Haley would be a good marriage that would throw a curve ball at the other BRE vendors. In the end, one of these rule engine sw vendors might decide to acquire Haley Rules just to keep it out of the hands of a competitor. Let's look at the broader IT market. IBM has said they're working on a rule engine. Microsoft has a couple of rule engines in the market. All of a sudden SAP jumped into the rule engine market. That leaves Oracle. Oracle has said or has been rumored to be working on a rules engine. Siebel started OEMing Haley Rules way before Oracle acquired Siebel. And if you look at the partner page for Haley (shameless plug: scroll halfway down to see BIZRULES!) the very first partner listed is... Oracle. hmm... If Oracle were to acquire Haley, that could be, in my opinion, the tipping point that helps the business rule management market break-through and ultimately become as big and as important as the database management market. I've been saying for a long time that we need to think of a rule engine as a rulebase. Just as databases have tables, columns, and rows, well rulebases have rulesets (i.e. tables), IFs and THENs (i.e. columns), and rules (rows). What rulebases (rule engines) need today is a standard way to add, update, delete, and query rules. Using some sort of declarative language like SQL... How about a standard Rule Query Language (RQL) for rules? With a Rule Definition Language (RDL) and Rule Manipulation Language (RML) similar to the Data Definition Language (DDL) and Data Manipulation Language (DML) that comes with SQL. Once rulebases share a common rule query language, I believe the rules market will take off and that managing rules will become as vital to business as managing data. Oracle acquiring Haley could be the tipping point that really gets this market moving and growing. Maybe getting Oracle, IBM, Microsoft, and SAP into the business rule engine space is what will really move business rules management and business rules automation to the mainstream. It's about time... and money. As Bill Gates once said, this is what the IT industry owes to it's customers.